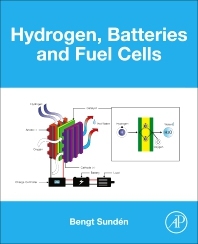 Hydrogen, Batteries and Fuel Cells provides the science necessary to understand these important areas, considering theory and practice, practical problem-solving, descriptions of bottlenecks, and future energy system applications. The title covers hydrogen as an energy carrier, including its production and storage; the application and analysis of electrochemical devices, such as batteries, fuel cells and electrolyzers; and the modeling and thermal management of momentum, heat, mass and charge transport phenomena. This book offers fundamental and integrated coverage on these topics that is critical to the development of future energy systems. Bengt Sundén graduated as a M. Sc. in Mechanical Engineering at Chalmers University of Technology, Göteborg, Sweden in 1973 and presented his PhD-thesis in thermodynamics and fluid mechanics in 1979 at Chalmers University. In 1980 he was appointed Docent (the highest academic degree in Sweden) and held positions there as Research Associate, Docent and University lecturer. In 1992 he was appointed Professor of Heat Transfer at Lund University, Lund, Sweden. Since 1995 he serves as the Head of the Department of Energy Sciences.